Updated 9:44AM, Monday October 29th, 2012	by Hefin Rhys Jones, Christian.co.uk Be the first to comment! 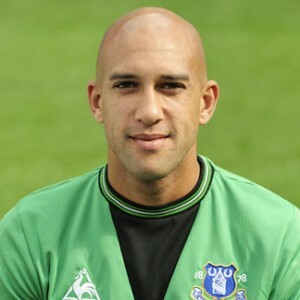 US born Everton FC goalkeeper, Tim Howard, has more ‘crosses’ to cope with those of the opposing team. Yet somehow he finds peace – a peace he first saw in his grandmother. Where does that come from, and what does it mean to him? As one of the Premiership’s top keepers, Everton's Tim Howard is a quality operator. Known for his tremendous shot killing skills and ability to deal with the toughest crosses, he's made over 250 Premiership appearances since moving to the EPL with Manchester United in 2003. But despite his footballing achievements and all that the game means to the 33 year-old, it isn’t the most important thing in his life. As a committed Christian, he says being a child of God is the most important thing. But the married father of two has another kind of ‘cross’ to deal with. Tim Howard has Tourettes syndrome, which can lead to uncontrolled verbal outbursts and physical spasms. The condition remained undiagnosed for the first 10 years of Howard’s life, which made for a difficult time. It was his grandmother’s faith that provided the youngster with a sense of peace, eventually leading him to Christ. Tim Howard acknowledges that living with Tourettes is not easy but believes that coupled with his sporting ability, God has brought good out of his illness. “God has blessed me with the gift of Athleticism as well,” he said. And it’s his faith which gives him a different perspective on his career to most footballers. “Today, I am blessed to be living a dream. And yet, if it all went away tomorrow, I know I would still have peace. That probably sounds crazy to most people, but that’s the kind of peace Christ gives. It is rooted in his love, and it surpasses all understanding.” Without doubt, Tim Howard is shining Christ’s light on the world’s biggest sporting stage. Want to find peace through spiritual growth?